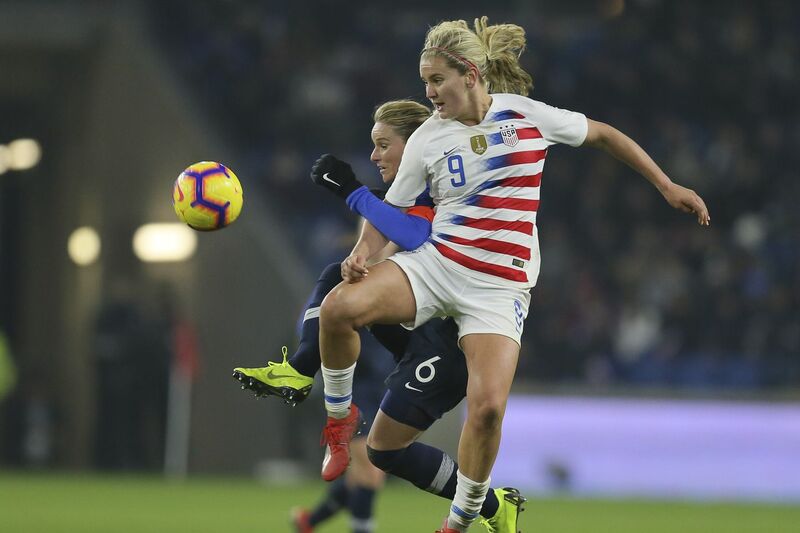 Lindsey Horan vies for the ball with France midfielder Amandine Henry during a women's international friendly between France and United States in January. The U.S. women’s soccer team announced its roster for the SheBelieves Cup on Tuesday, and the biggest news involved a player not on the team. Midfielder Lindsey Horan, whose creative playmaking and big goals have made her a near-automatic starter, has been sidelined by a quadriceps injury. Details of when and how she suffered the injury were not disclosed. In signing Marco Fabián, Union owner Jay Sugarman broke his resistance to big moves. Will it stay broken? Horan shouldn’t be out for too long, but her absence will be notable when the Americans begin the tournament against Japan at Talen Energy Stadium on Feb. 27.
Who might replace Horan on the field? U.S. coach Jill Ellis has a few options — and her decision could have a big impact on the World Cup roster. Horan has lately been deployed in a somewhat deep midfield position in the national team’s midfield triangle, in an effort to get her and fellow playmaker Rose Lavelle on the field together. With Lavelle positioned high and Julie Ertz enforcing from the base, the open spot seems tailored for a box-to-box player. That player could be Samantha Mewis. It’s fair to say many national team observers hope it is. She was a commanding presence for last year’s league champion North Carolina Courage, and has often excelled with the national team. But Mewis played in just seven of the U.S.' 20 games last year. That was in part due to a knee injury that sidelined her for the SheBelieves Cup, but there were also coach’s decisions along the way. Mewis played just 20 minutes combined in the Americans’ recent games in France and Spain. The second option is Danielle Colaprico, whose strong play with the NWSL’s Chicago Red Stars earned her call-ups for the Americans’ trips to Europe in November and January. She is in the thick of the competition for the World Cup squad’s last roster spot. Good showings in the SheBelieves Cup could earn her the trip of a lifetime. We might also see Andi Sullivan, who’s more of a prospect at the moment but could get a shot to make a statement. A player who had been in the mix is notably not on this roster: national team veteran Morgan Brian. She hasn’t looked great in recent games, and her absence is Ellis’ decision. Danielle Colaprico's good performances for the Chicago Red Stars earned her call-ups to the U.S. women's national team. The rest of the 23-player squad is as expected: Ertz, Tobin Heath, Alex Morgan, Megan Rapinoe and so on. Players will report to Tampa, Fla., on Feb. 19 for training camp before flying to Philadelphia a few days before kickoff. The Americans have eight games left before the World Cup begins. Their three at the SheBelieves Cup will be among the toughest tests. After facing Japan, the U.S. will play England in Nashville, Tenn., on March 4 and Brazil in Tampa, Fla., on March 8. England is ranked No. 4 in FIFA’s global standings, Japan is No. 8, and Brazil is No. 10. The other teams will also play each other in a round-robin format. Each game day is a single-ticket doubleheader. While the weekday scheduling here — not to mention the cold weather — may be a nuisance for fans, it’s a chance to see four teams that will be headliners at the World Cup. Tickets are available through U.S. Soccer’s website, by phone at (800) 298-4200, and at the Talen Energy Stadium box office. U.S. coach Jill Ellis has also invited goalkeeper Jane Campbell, defenders Merritt Mathias and Emily Fox, and midfielder Allie Long to participate in the pre-tournament training camp. This was my #USWNT World Cup roster depth chart before Morgan Brian was dropped. At Talen Energy Stadium, Chester, Pa.
At Nissan Stadium, Nashville, Tenn.
At Raymond James Stadium, Tampa, Fla.